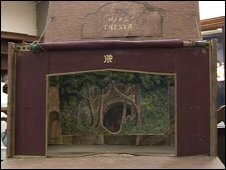 A miniature theatre used by Thomas Hardy's original actors has sold for double its estimated value at auction. The model, with interchangeable sets, was built using cardboard and glue by local stone mason Thomas Henry Tilley in the early 1900s. It was used to test scenery ideas for The Hardy Players' performances at the Corn Exchange in Dorchester, Dorset. The theatre was bought by the Dorset County Museum for £2,000 when it went under the hammer at Duke's Auctioneers. 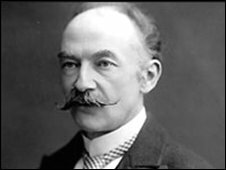 The 9.5in x 9.5in (24cm x 24cm) theatre, set designs and a small collection of original booklets relating to Thomas Hardy and the actors were only expected to fetch up to £800. The Hardy Players disbanded in 1928 after the Dorset-born writer's death aged 87, but reformed as the New Hardy Players in 2005. Mr Tilley, who was also a builder, spent his spare time designing and making many of their sets as well as performing in the productions. Amy Brenan, valuer at Duke's Auctioneers, said: "As far as we know, this is the only miniature theatre used by The Hardy Players to plan out the technicalities of their productions. "The miniature set designs are all hand-painted in watercolours and include sets used for The Return of the Native, Tess of the D'Urbervilles and The Woodlanders. "The set design would have been instrumental in creating the correct atmosphere for the story. "Considering that, for much of the audience, this was the first time they had been able to access Hardy's work, this miniature theatre is an important tool into seeing how the players communicated. "It is amazing it has survived the years and stayed local to Hardy's hometown." The set was given to the vendor's family by Mr Tilley and handed down through generations.